That it didn’t come from the Conservative Party, but from Stephen Harper’s office himself. That third point means Mr. Harper has a personal interest in ensuring that every riding in Alberta is Blue. I almost feel honoured. This isn’t the first time that a riding has been targeted by the Cons from afar. Saskboy in Regina has received a number of these pamphlets over the past year. So thank-you Mr. Harper for spending our tax money to try to convince us that electing you a majority is the only way you’ll be able to cooperate. Thanks for including this. 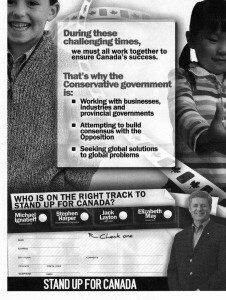 Makes me wonder how many of these have even been sent to Harper’s OWN riding! When i lived in the Toronto riding of Don Valley West, we got tonnes of those things – often several a day, and 2-3 times a week. I later read in a Toronto Star article that it was the most targetted riding for those Con spam flyers. With the incumbent Liberal MP retiring (John Godfrey), i guess they figured they had a shot at winning it. They didn’t – the Libs hung on to the seat. I now live in a very safe Liberal seat, so no more Tory spam. You have to give Harper and the Cons credit for the amazing and complete 360 degree reversal in the tone of these things. Where are the demeaning pictures of opposition leaders? Off-colour references to junkies? Anti-gun control messages targeting long forgotten gun registries? This one almost makes you feel warm and fuzzy. Shudder. There’s children (not suggestively threatened by imaginary drug-pushers), for God’s sake. And people of color! the gun registries are not long forgotten for those who must suffer with its invasive questioning and mounds of paperwork for trivial activities. Not to mention potential criminal charges if you loose forget a piece of paper at home. If the NDP and liberals dropped their support for the registry and promised to scrap it they would get more support in western Canada. Many conservative voters only vote that way because the Libs and NDP either support the registry or banning handguns. I personally know people who are socially minded, and would vote either Lib or NDP, however with both those parties advocating a handgun ban, they are forced to vote conservative, or risk loosing 1000s of dollars from confiscation of their posessions. Thanks for the comment. Are there that many handgun owners though? I know a lot of rural rifle/shotgun owners (including my father and most of his friends), but I don’t know anyone who owns a handgun? As per the registry, it was bumbled, everyone knows that. Should everyone be free to own any firearm they want? Probably not (to RPGs etc. ), but I agree that the average farmer shouldn’t be unduly punished for owning a rifle to go hunting. Yes there “Are” that many restricted (both long gun as well as handgun) owners in Canada. Guess who also has deep pockets. Guess who, my wife in particular, want the right to use tools for self defense. If you guessed the LAW ABIDING firearm owners of Canada, you guessed right. The fact that the left would leave the average person defenceless against both criminals, as well as the govt. is the reason you will never get our support.